Alopecia areata can affect men, women, children, any race and any hair type or color. And whilst the good news is that it only affects about one or two per thousand, that comforting thought means absolutely nothing if you’re one of the unlucky few. That's because this is arguably the most scariest type of hair loss due to its speed and severity - areata can very quickly form totally bald patches on the scalp. 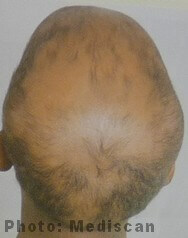 Alopecia totalis - Loss of all scalp hair. 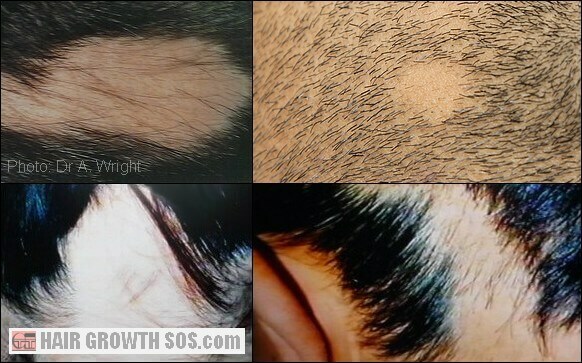 Alopecia universalis - Loss of all body hair. This page details all three types - symptoms, cause and treatment (conventional, natural and future). The effects these conditions have when they develop in children is also discussed. 1. Alopecia Areata - Overnight Hair Loss! It might be a single, small bald spot. Which, of course, would be bad enough. But you could get multiple spots or larger patches instead. Basically, the shape, size and area affected, can all vary from patient to patient. However, the one defining characteristic that always seems to be present is just how fast it can happen. Alopecia areata tends to develop very suddenly – you could develop bald spots literally overnight! But just as a bald patch can quickly develop, it can also quickly disappear, never to return. This happens in about 30% of patients. However, for most, alopecia areata will unfortunately affect them again, possibly on and off throughout their lives or even develop into permanent areas of baldness. And whilst the affected area could be anywhere on the body that grows hair, it's usually on the scalp (probably because it’s the fastest, most actively growing region of hair on the body). 2. Alopecia Totalis - Total Hair Loss! 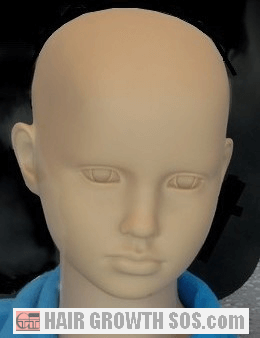 When alopecia areata is bad, it's really bad! 1. You could lose all your scalp hair within a week. 2. It can happen at any time. 3. It can be permanent. 4. Many different things can trigger it. 5. It can run in your family and affect children as well as adults. 6. No one really knows exactly what causes it. Sounds totally evil doesn’t it? And that’s exactly what it is – causing misery to pretty much everyone it affects. As already mentioned, alopecia totalis causes total hair loss of the scalp. In other words, not just in the male pattern baldness region (as in most cases of hair loss), but also the eyebrows and eyelashes. The very strange appearance this creates can cause extreme stress. And since stress might be one of many possible triggers for this disease (see Cause section below), this can only make any chance of recovery from alopecia totalis even less likely. 3. 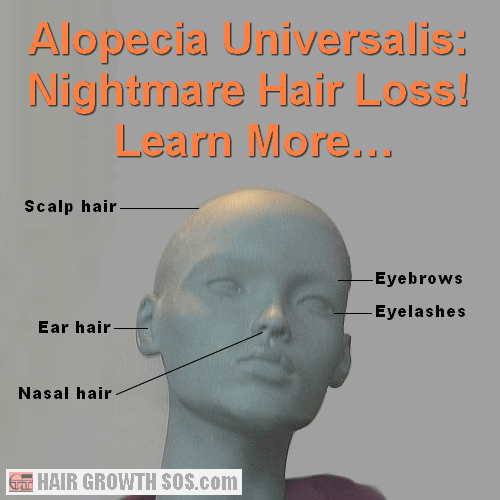 Alopecia Universalis - The Worst Type of Hair Loss? 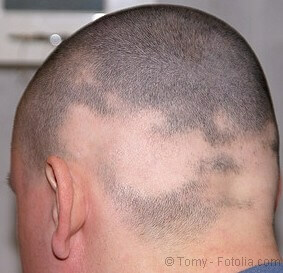 Alopecia universalis is the most extreme and probably worst version of alopecia areata possible. That's because this type of hair loss means exactly what it says: "universal loss" i.e., everywhere! From nose to toes, complete baldness develops across the whole body including the head (as with alopecia totalis) but also the arms, legs, chest, pubic hair, etc. Even hair in the nose and ears can be lost, making you more susceptible to germs, bugs, dust, etc. which can then enter the body more easily. And, like alopecia areata and totalis, it can happen very rapidly - causing total loss of your scalp hair within a week. All of which can be the stuff of nightmares, being traumatic for everyone involved (i.e., friends and family too). About 20% of people with alopecia areata go on to develop universalis. And that includes children. Children are just as likely to develop one of the areata variations of hair loss as adults. But, when children develop this condition it can seem particularly cruel because they may not yet be emotionally mature enough to cope with things like teasing at school, etc. And when they develop alopecia totalis or universalis, it must seem even worse. That’s because, if a child develops complete baldness before puberty, the chances of permanent recovery are very low (about 1%). Also, whilst it might be possible to cover over one or two areata spots, hiding total baldness is not. What Causes Alopecia Areata, Totalis and Universalis? Alopecia areata is a non-contagious autoimmune skin disease in which your body’s immune system sees your own hair follicles as foreign, and so, attacks them causing follicle cell destruction and hair growth to completely stop. 3. Atopic conditions – These include eczema and asthma, both of which have been associated with this type of hair loss. Both areata and atopic conditions can involve an autoimmune response, so therein lies an obvious connection. In fact, these two conditions can coincide in up to 50% of areata cases. Children who inherit an atopic condition may be particularly at risk from the areata family of hair loss. 4. Langerhans cells and helper T lymphocytes – An excess of certain autoimmune cell types might be to blame. Areata patients appear to have up to ten times more "Langerhans cells" than is normal. And if there’s an excessive number of "helper T lymphocytes", the imbalance this causes could be the trigger that destroys follicle cells. 5. Other autoimmune diseases – Your chances of developing areata might be higher if the following autoimmune diseases run in your family: Addison's disease (adrenal gland disorder), diabetes type I, rheumatoid arthritis, vitiligo (patchy loss of skin color). The following five types of conventional treatment may be used with all three forms of alopecia areata (i.e., they may help even the extreme forms of alopecia totalis and alopecia universalis). Corticosteroids are very strong anti-inflammatory drugs that inhibit the immune system. So, since all types of areata involve an autoimmune response, steroids can often help. But the degree of success depends upon a number of things, such as how severe the condition is, and the dose of the drug given. Steroids can be given by injection, orally (tablets), or topically (creams, ointments, etc). Injections - Injections are often the preferred choice because they can be applied directly to the bald areas. And this means that a smaller dose can be given, which reduces the risk or serious side effects. But, injections can only really be used in less severe cases (small bald spots and patches) basically because injections are so painful! A TV program I once saw, showed steroids being injected several times over the affected area, and it looked like an extremely painful experience. However, it did produce some hair regrowth after a few weeks of treatment. Orally - If steroids are taken orally, the dose will be higher, and the drug can affect other parts of the body too. So there’s an increased risk of nasty side effects: osteoporosis, diabetes, high blood pressure, etc. if taken long term. This drug is applied as a foam or lotion. It’s most often used to treat male pattern baldness, but can also help with small patches of alopecia areata. However, it is unlikely to be of any help to people with severe hair loss as in alopecia totalis. As mentioned above, minoxidil can be used in combination with steroid treatment to increase the chances of success. Learn about possible minoxidil (Rogaine) side effects? Since areata is an autoimmune disease, some success has been achieved using treatment to suppress the immune system. However, this drastic form of treatment runs the risk that a patient’s resistance to infection will drop like a stone and lead to serious illness. So they must be carefully monitored. A drug called psoralen can be combined with ultraviolet light (UVA) to form PUVA treatment. PUVA can reduce or even eliminate Langerhans cells. These are a type of autoimmune cell that have been linked to the areata family of diseases (see Cause section above). Temporary hair regrowth can be achieved. But, this type of treatment requires a big commitment in time - up to five sessions per week are typically needed (and for at least a few weeks before any results begin to show). Also, psoralen has a photosensitising side effect whereby the patient must avoid direct sunlight for a day or more. Plus, other side effects might affect your eyes and skin. Final note: UVA light is associated with skin aging (including skin cancer); UVB light is associated with sunburn. Hair transplant surgery might be possible in some less severe cases but, given the unpredictable nature of this disease, other treatment options might be better. So, to summarize these five types of treatment: whilst alopecia areata is clearly a very nasty disease, conventional treatment methods sound pretty nasty too! In the UK, a case involving a 16 year old girl with both alopecia areata and IBS (irritable bowel syndrome) was reported to have had some success. By treating her IBS (by refining her diet and using probiotic supplements) hair regrowth was also achieved. It appears that, by alleviating the symptoms of IBS, the dietary stress it caused was also reduced, allowing hair regrowth to occur. This link between stress and diet was further supported when she stopped taking the supplement for a week causing her symptoms to return. This idea stems from the fact that all areata diseases are centered around an autoimmune response from the body against hair follicle cells. Primula obconica is a plant that causes an allergic reaction (skin rashes). And it’s believed that this might deflect the immune system towards what the body considers to be a more serious (external) threat rather than the (internal) "threat" from the hair follicles. Some success has been achieved when a primula obconica leaf was strapped to the arm for a few days, then taken off and rubbed onto the scalp. Another leaf was then attached to the arm. After a month, new hair started to grow. However, this method might need to be combined with steroid injections to get the best result. Essential oils of lavender, lemon, sandalwood and tea tree all massaged into the scalp might be effective. Note: Essential oils are never applied neat - you should always use a carrier oil such as almond oil, olive oil, etc. to dilute them first. 4. What about my own natural methods? Unfortunately, no. It’s highly unlikely that my methods will help those with any of the areata family of diseases. That’s because areata is an autoimmune disease, but the type of hair loss that I suffered from (androgenetic alopecia aka male pattern baldness) is not. For alopecia areata, you first need to identify and successfully treat the underlying cause of the condition (i.e., the trigger mechanism of the autoimmune response that’s killing your hair follicles) before any form of self-help alopecia treatment can be expected to help. In August 2014, it was reported by the Nature Medicine journal that researchers from Columbia University had used a drug normally given to treat a bone marrow condition to completely reverse the hair loss suffered by three patients with moderate to severe alopecia areata. The drug (ruxolitinib) was considered successful following five months of treatment with two pills taken per day. So, good news at long last! Hopefully, it should now just be a question of showing that recovery from alopecia areata works in a larger study and is completely safe for patients. 2. Could hair stem cell cloning also help? Although the autoimmune response that causes all these areata diseases will attack and kill off hair follicle cells, it does not attack the hair follicle stem cells. These stem cells remain alive and well, which means that they should still be able to fulfill their vital role of providing new cells to the hair follicle in subsequent hair growth cycles. So, the tantalizing possibility for full hair regrowth remains (even for those who have total hair loss from alopecia universalis). But there do seem to be big problems with stem cell research into hair regrowth. And you can find out what these problems are by reading: hair cloning. Also, the success of any future hair stem cell technique will almost certainly depend upon the trigger mechanism for the autoimmune response first being identified and successfully treated. If specific genes are confirmed as being part of this trigger mechanism, then perhaps gene therapy might be able to help. In the meantime, I guess many areata patients will be sitting, waiting and hoping for that day to arrive soon. Given that shaving your legs, etc. can be such a chore, you might think that some women would love the idea of having the permanently super-smooth, hair-free body that alopecia universalis creates. But there’s no way that could ever make up for the total loss of what is, perhaps, a woman's predominant symbol of youth, health and beauty – a full head of hair. Dealing with the shock, stress, depression, etc. that total hair loss can cause is likely to be one of the biggest challenges that anyone will ever face. And there's also the uncertainty of not knowing when, or if, your hair will ever regrow. So, if alopecia universalis has taken all your hair, some relief might come from hiding it using wigs, caps, scarves, etc. For small patches of areata, hair loss concealers like Dermmatch, Mane, Nanogen fibres or Toppik might help. But, these products do have issues – several of which are raised in this hair loss concealer review. There can be other reasons for sudden hair loss besides alopecia areata, totalis or universalis. But none are likely to be anywhere near as rapid or severe. So, chances are, if you’ve got this type of hair loss, you'll already know what it is!